Easy to handle cables..... no more mess. Is the tangle of cables under your workstation or in your HIFI installation a familiar sight? Not only does it look untidy, but it also interferes with your work and that of others. It creates dust traps, causes unnecessary computer, network and HIFI breakdowns, leads to short circuits and thus fire risks, and causes loss of data and working hours! This ‘cable spaghetti’ seems unavoidable when you need to use so much electronic equipment. But this doesn’t have to be the case! 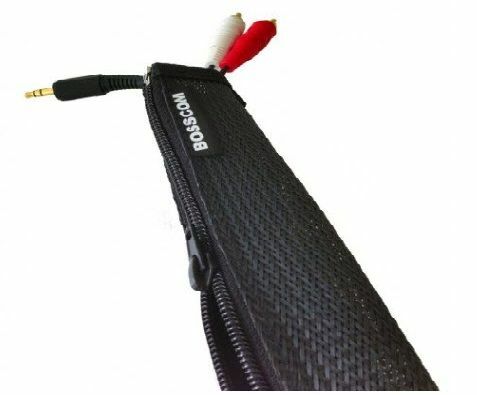 You can put the cables under your workstation or your HIFI rack in order by using BOSSCOM cable socks. Besides improving your own workstation, this will also create a better working situation for others. ICT staff, for instance, will be able to do their job quicker and more efficiently, which will benefit the quality and performance of your equipment and network. Cleaners will be able to work better and faster, in accordance with the cleaning contract, which will reduce costs. Fire risks will be avoided, as will loss of data and working hours. Reorganizations can be carried out quicker and more efficiently and the danger of tripping over cables will be a thing of the past. In short, with the correct application of BOSSCOM cable socks, you will improve the efficiency of your organization and create better air conditioning and a better ergonomic environment. In this way, BOSSCOM cable socks is created, which simply works better! - Improved quality and performance of your network and peripherals. - Reduce risk of fire. - Prevention of loss of data and working hours. - Reduced risk of tripping over cables. - Quicker and more efficient reorganizations.